A little movement in the shrubbery catches a person’s eye. The person turns to look, expecting a bird, perhaps. But instead it’s a kitten. 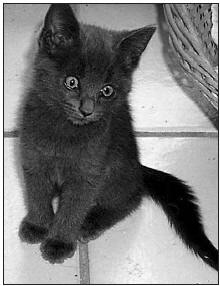 A beautiful gray kitten, no more than eight weeks old, with blue eyes, gazing back at the person. What’s a kitten doing on the ASU campus? Trying to survive, just like the other feral cats who make their homes under various buildings and shrubs all across the campus. "There are probably at least 60 feral, or wild, cats on the Tempe campus," said Ig Tsong, a physics and astronomy professor. Tsong, one of the "cat people" who help care for the homeless felines, said people – including students moving away – turn unwanted cats loose on campus, thinking someone will adopt them. But once the cats become feral, it’s difficult to capture and tame them. Feral cats have lived on the ASU campus for a long time, and until recently, there was no united effort to help them. Priscilla Benbrook, an administrative secretary in the Chemistry & Biochemistry Department, got the ball rolling, spending a lot of her personal time searching out the "cat people" on campus and bringing them together. "I had been trapping cats on and off since 1992, when I was an undergraduate. I knew there were a number of concerned individuals investing a lot of love and effort in maintaining the cats on campus – a lot of cat people lurking in the bushes," she said. "In the fall of 2001 I came across a kitten in a trap and finally had had enough. In January of 2002, I started this group." The new nonprofit organization, Mild Cats at ASU, set up a Web site, and immediately implemented a "TNR" (trap, neuter and return) program on campus, in line with the latest TNR policy implemented by the Maricopa County Animal Care and Control (which pays for neutering and rabies shots). Mildcats, as the group informally calls itself, tries to place the cats or kittens if they can be socialized. Otherwise, they are brought back to their "homes" on campus, after they are neutered, and volunteers continue feeding them. Trapping the kittens and cats is almost the easiest part. The most difficult factor is finding homes for them. Most of the "cat people" already have a houseful of felines, including several ASU cats, so Mildcats is looking for cat lovers to step up to the plate – and to make lifetime commitments to the cats, Tsong said. To see pictures of kittens needing homes or to volunteer or donate food, go to (www.mildcatsatasu.org). And that gray kitten with the blue eyes? Sorry. She’s already spoken for. This small kitten is one of many found by Mild Cats at ASU, a non-profit organization that finds new homes for stray and abandoned kittens living on Main Campus. Smith, with Public Relations, can be reached at (480) 965-4821 or (jps@asu.edu).